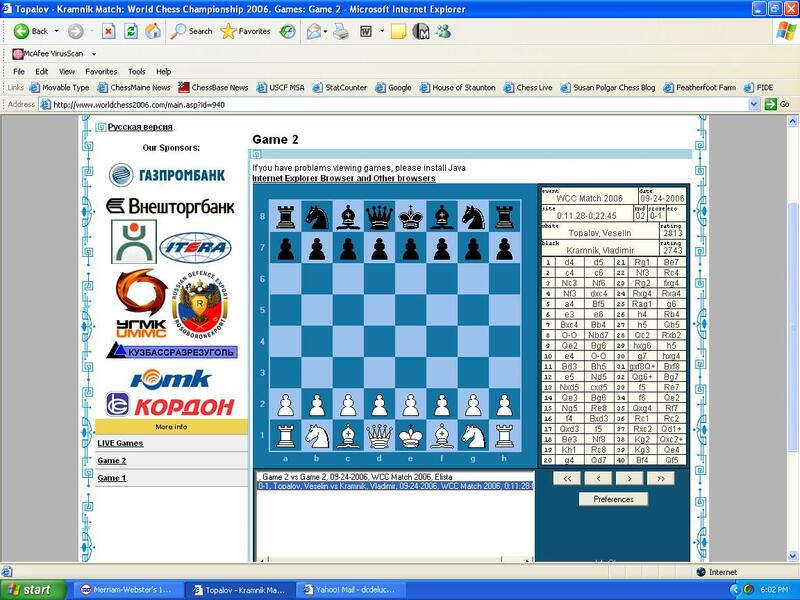 09.24.06 Important information for viewing the World Chess Championship Match using the LIVE Game Link: after clicking on the LIVE Game Link from any of the ChessMaine.net World Chess Championship Match entries, a selection of games will appear i.e., Game 1, Game 2 etc. Choose the game number you wish to follow LIVE or a game from a previous round. A board and notation window will appear. Just below the board you will see (for example) Game 2 09-24-2006, WCC Match Elista, 2006 0-1 Topalov, Veselin vs Kramnik, Vladimir. You MUST click on this link in order to activate the LIVE transmission. Good luck, enjoy the games, and let us know if you experience any difficulties. Note the link just below the board. Users must click this link to activate the LIVE transmission.